"What IS THAT?" A child would ask. "A brain!" A volunteer would reply. "No?! What kind of brain? Like a human brain?" "Yep. A human brain. Wanna touch it?" "Ewwww, nooo.... [starts to run away, then approaches again gingerly, but very cutely] Hmm... hmm... YES!" 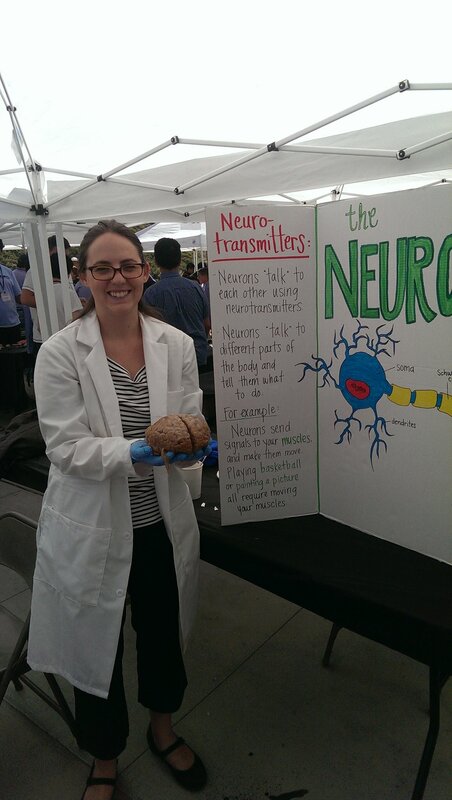 Then on Monday, October 21st, more Psychology in Action members volunteered with Interaxon for a more in-depth version of the Brain Booth for interested undergraduate UCLA students. They discussed the surface anatomy of the brain, answered questions, and invited students to handle the brain as well! Andrew Westphal, a Doctoral student from the Psychology Department. We would like to thank the donors of the specimens displayed at these events (our volunteers treat the brains with the utmost respect). Your generosity helped inspire scientific curiosity for children and undergraduates in the Los Angeles area!